We are loading the Boston Duck Tour bus. Our driver, "Fluffy Ruffles", is "quacking" some jokes. I immediately get the eye roll from my teens. I know what they’re thinking, not another "canned" tour bus ride. But as we settle into the authentic, "renovated World War II amphibious landing vehicle", basically a bus that can ride on land or on sea, the kids back away from the attitude and start to actually listen to the tour. 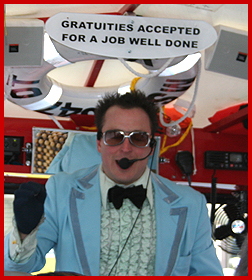 Kudos go to Fluffy, as he morphed from joke cracking waterbird, to fact spouting tour guide. Extremely knowledgeable on Boston history, Fluffy mixed history book facts with au currant tidbits to interest any potentially bored teenager. The ConDUCKtor talked blood during the Boston Massacre, quipped specifics on the value of the gold on the domed State House, and even pointed out the hotel used in the filming of "The Suite Life of Zach & Cody". After a thorough tour of Boston, including a quick amphibious boat ride, the kids were smiling and ready for more on Boston history. There's so much to do in Boston, it's tough to zero in on what to cover. We had a weekend, and packed it pretty full, but left time to meander the Freedom Trail and window shop along Newbury Street. Teens may think they know what they want, and you are pretty safe with dining and shopping, but be sure to pepper your time in Boston with some off the beaten path activities, cultural, and historic venues. History: It's everywhere! 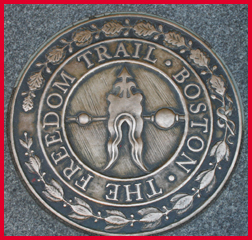 The Freedom Trail is a nice starting point – grab a map and go. Or schedule a walking tour for more in-depth knowledge on historic buildings and events. We chose to go the rogue route, walking a bit of the trail on the way to other activities. My teens found the cemeteries intriguing, with the grave stone of Paul Revere and the tomb of Samuel Adams at the Granary Burying Ground of interest. We searched out John Hancock's tomb and they made the connection to the Declaration of Independence and signing their "John Hancock". Voila – history at work. Avid "Fluffy" students, as we hit the site of the Boston Massacre we already knew that the massacre was less an uprising than a small riot that got out of control. The Old South Meeting House, surrounded by skyscrapers, is a nod to Boston's good sense of historic preservation. 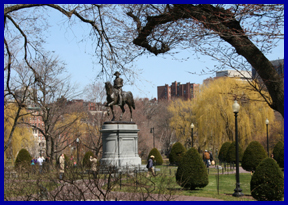 A fine day for a walk, we explored Boston Common, a picturesque park full of families, students, and tourists. It's hard to imagine that this open land was once used for hanging pirates and witches or publically humiliating criminals in head locked stocks. The witches garnered some interest by the teen set, with Salem just a short drive away on a future agenda. Shopping: Through the Common, we headed towards shopping at the Prudential Center and Newbury Street. We did a quick detour to the Skywalk Observatory to get a panoramic view of the city. While pretty, it didn’t garner much interest with the teens, but worth a visit if you have a Boston CityPass. It did give a good overview of Boston, with a good view of Fenway Park in particular. We did a quick trip through the mall (be sure to pick up a PRUferred Shopper Card for discounts), and then headed to the more picturesque Newbury Street. 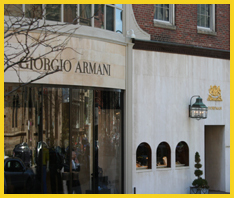 Rodeo Drive, Boston style, strolling Newbury Street on a sunny Saturday is a must for teens. We chose an overpriced sidewalk café, with a less than memorable menu, but were more than compensated with a streetside table for people watching. The Faneuil Hall Marketplace also has lots of options for souvenirs and teen oriented apparel stores. It's also a great place to people-watch, with frequent entertainment and lots of dining options. Cultural: Boston has enough museums and attractions to keep you busy for a couple of weeks. It's tough to choose: art at the Institute of Contemporary Art; science at the Museum of Science; Sea life at the New England Aquarium; in-depth history at the Old State House Museum? If you have limited time and want to hit as many as possible, check out the CityPASS, Boston, (citypass.com)for discounted tickets and line privileges. 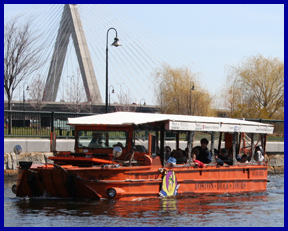 The GO Boston Card (SmartDestinations.com/boston) is worth a try – one price for entrance into some of the best museums and tours. One attraction that gets little attention in the guidebooks and discount racks is the Boston Ballet, with performances in The Opera House, a newly renovated gem of opulent history. With gilded ceilings and plush carpet, The Opera House is worthy of a visit, especially if the Boston Ballet has a scheduled performance. 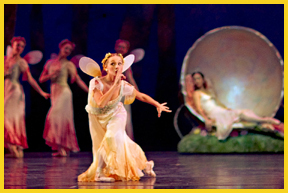 We were able to catch a performance of Balanchine’s A Midsummer Night's Dream, complete with fairies and princes. This probably rated a 7 or 8 on the teen index, with a higher ranking on the female side, than male; but a perfect introductory ballet for families with children. The Boston Ballet has several performances throughout the year, including a holiday performance of the Nutcracker. For details and ticket information see BostonBallet.org. Dining: There's a sure bet you'll discover some exquisite dining experiences while in Boston. Let's talk dessert first! After a magical performance at the Boston Ballet, we headed to Finale Desserterie & Bakery at Park Plaza (finaledesserts.com) . And what a finale! Plated desserts with art and flair, go for the dessert sampler – and go big, there will be something for everyone. 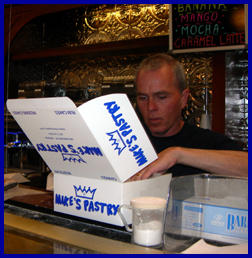 Since we are talking dessert, a must on anyone’s agenda, is Mike’s Pastry (mikespastry. com) for some authentic Cannolo (cannoli). This Italian delicacy earned a 10 on the teen scale. Located in the North End, there's a line out the door – choose traditional ricotta cheese or cream filling, or go with something more – chocolate chips, pistachios or a cannoli dip. Before the sugar overload, be sure to bulk up on some pasta at one of the North End restaurants. We chose Ristorante Euno (eunoboston.com> , a cozy bistro on the oldest street in Boston, Salem Street. Starting off with Caprese with Bufala mozzarella, we headed to Vitello Parmigiano, Veal Osso Bucco, and Zuppe di Pesce, a nice prelude to the cannoli dessert at Mike's. Boston's most celebrated dining experience is at Legal Seafoods (legalseafoods.com) . We chose the harborside location, with patio dining overlooking the harbor. While the menu didn't live up to other Boston dining experiences, the seafood was fast and fresh, though expensive. For seafood fresh off the boat or plane, try The Oceanaire Seafood Room (theoceanaire.com) on Court Street. In this elegant setting reminiscent of a 1930's ocean liner, we dabbled with some appetizers, but it was the grilled fresh fish that really earned kudos with the crowd. For more seafood try Mare on Richmond Street, or Skipjack's on Clarendon Street. 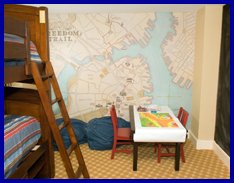 Accommodations: Boston has several family friendly hotels throughout the city. We chose the Omni Parker House based on its close proximity to the Freedom Trail (it's on it!) and other points of interest (Faneuil Hall, Boston Commons, etc.). Celebrating over 150 years, The Parker House is the longest continually operating hotel in America. With ornate décor, The Parker House has some historic tidbits worth sharing: John F. Kennedy made his first public speech in the Press Room while attending his grandfather's Honey Fitzgerald's birthday party; Malcolm Little, later known as Malcolm X, was a bus boy in Parker's Restaurant in the early 1940’s; Ho Chi Minh was a pastry chef in Parker's kitchen from 1911-1913; the Boston Cream Pie was created in the ovens of Parker's Restaurant in 1867, now the official Massachusetts state dessert; "Scrod", or "catch of the day" was first termed here; and The Saturday Club, a group of famous writers made the Parker House home including Longfellow, Dickens, Ralph Waldo Emerson, and Nathaniel Hawthorne. The Parker House is family friendly offering hotel rooms as well as the unique Freedom Trail Suites – one bedroom, a common living area, and connecting to a children's sleeping nook with bunk beds, bean bag chairs, and activity chairs. One entire wall is a chalkboard, while the other is a large scale mural displaying the route and landmarks of the Freedom Trail that goes right by the Parker House entrance. Now that's a history lesson you won’t forget (omnihotels.com). The best advice for a Boston weekend with teens is to sketch out an itinerary, but be flexible – wander, walk, eat, shop, and take in the "moments" of history. For more info planning your getaway see BostonUSA. ......Tammie Thompson lives to travel. It’s all about the adventure, whether it’s hiking a local mountain, snorkeling a Caribbean reef, or tasting fresh powder snow. Tammie lives in Truckee, CA with her husband, two adventurous children, and Elvis, the mountain mutt.